It was one of those typical hospital sofas. The rubbery, terrible green, squeak-when-you-move jobs. It was long enough for a couple of people to sit on, but too short for any normal sized person to lay down on. The cushions were made of some type of foam that probably should be reserved for things like dampening vibrations in car doors. On that hospital sofa, on a Saturday morning, my family changed forever. The doctors were all incredibly nice. The head of the pediatric neurosurgery team was a middle-aged, balding, soft-spoken man who often had to push his glasses up a bit. His team was with him. His head nurse sat down next to my wife Merri, and was playing with our son Josiah as the doctors settled in, exchanging glances. None of them opened the folders of paperwork they brought with them. No jokes were cracked; no small talk was required. It looked like an episode of House, minus the jackass. And the cane. And Olivia Wilde. I don’t remember all the words the doctor used. I’ve heard people describe “out of body experiences,” but I never really believed such things ever happened. But there I was, having one. Only the highlights were processed enough to become memories. Words like surgery, tumor and blindness floated by like fog over water. I couldn’t quite grasp onto any of them, and it all seemed … hazy. This is my favorite photograph I’ve taken of Josiah. 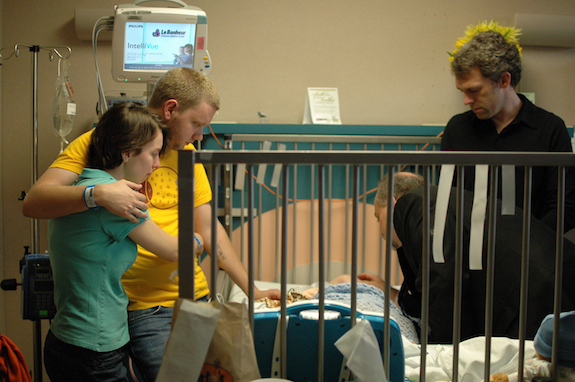 He was just barely 6 months old, in a hospital bed, with more caregivers than most people have when they’re dying. I still weep when I come across this picture. The day before, a routine checkup had ended in a conversation of “drive to the hospital. Don’t stop to go home, don’t stop for lunch. There will be doctors waiting for you in the ER.” Needless to say, we were shaken, but not until an MRI and that conversation on that creaky plastic couch at Lebonheur Children’s Hospital did we know the full extent of just how bad things were. Starting those very first hours, our church — Redeemer Presbyterian Memphis — was right beside us. Our pastor baptized Josiah in the hospital that Sunday afternoon. It was Mother’s Day. Hospital administration heard about it, and came to visit us and show their support. Two days after the doctors told us the news, the same group of men and women removed a section of our son’s brain tumor. When the results of the biopsy came back, it confirmed what the doctors had told us: our six month old had a very serious form of brain cancer. He has had several subsequent operations to add shunts to relieve intracranial pressure. We all have natural drainage system we all have in our brains to take care of cerebrospinal fluid. Josiah’s tumor damaged his so severely that he required shunts on each side of his brain to deal with the pressure. As soon as Josiah was healing from surgery, we were sent to St. Jude Children’s Research Hospital. Over the next 18 months, he would undergo 16 rounds of chemotherapy, several of which he got before he turned one year old. 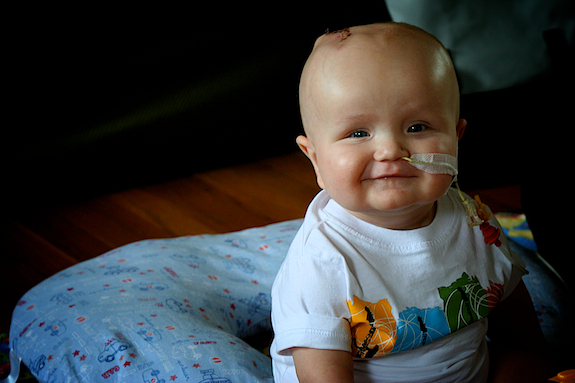 His treatment was designed by the top pediatric neuro-oncologists in the world. And that’s not an exaggeration. 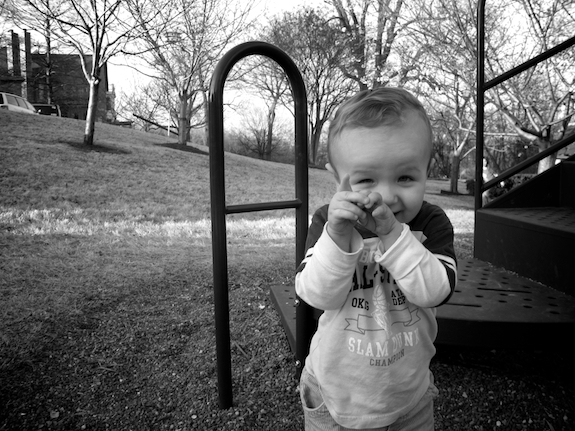 Several months after his treatment began, Josiah ended up in the hospital with back-to-back cases of pneumonia — a dangerous thing for anyone, let alone someone with a compromised immune system due to chemo. Doctors discovered after a barium swallow study that Josiah’s timing (for lack of a better word) was off, meaning he was getting liquid into his lungs while he nursed. He got a feeding tube and pump. For months, he had to be hooked up to a machine so he could eat. It was the hardest thing for me to see him go through. Here’s a photo of him, taken in August 2009, with the tube. It pains me to see it even now. Thankfully, he was able to move to a MIC-KEY button in his stomach, allowing him to move much more freely. The feeding machine wasn’t needed longterm, which made Merri and I feel a lot better. Today, he eats and drinks on his own, and we just use the button for supplemental liquids and medicine. 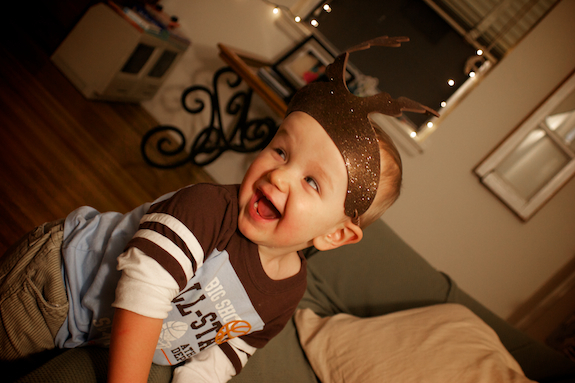 Having our baby undergo chemotherapy was hard, and even though it became a little more routine over the year and a half of his treatment, the strangeness never wore off. Nor did the uneasy feeling I got each night when I had to leave Merri alone to sleep one yet another terrible hospital couch so I could sleep enough to work for a few hours the next morning. 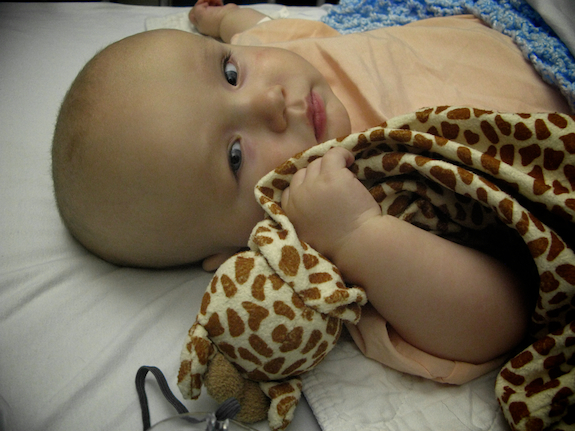 Treatment was usually given overnight, though Josiah’s PICC line. After two near-sleepless nights for us (not for Josiah — they gave him medicine to sleep), we’d go home, and wait for his counts to fall and pray against infections and germs. While Josiah never got very sick from the chemo, he would spend days laying on the couch, curled up with one of us, completely and utterly worn out. Each round, we had to worry about any little infection. A fever, runny nose or even a cough was an emergency. What’s amazing is that for all of this care — chemo, MRIs, surgeries, physical therapy and more — St. Jude hasn’t charged us a single dime. Josiah has racked up over $2 million in medical bills. They take care of everything, including feeding us when we are there. It truly is a fantastic facility, with the best doctors, nurses and researchers in the world. 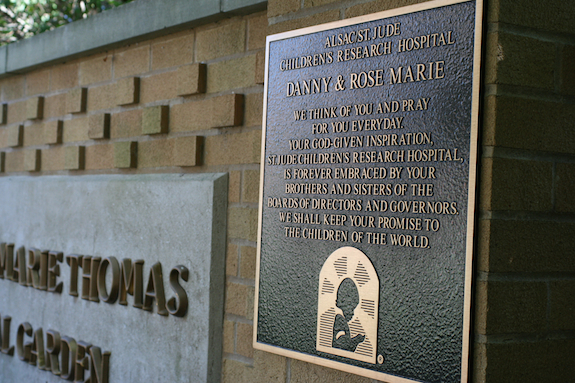 St. Jude was founded by the famous entertainer Danny Thomas, who believed that “no child should die in the dawn of life.” He named the hospital after St. Jude, the patron of hopeless cases. It’s the single best hospital on the planet for children with cancer, and it was right here in our hometown of Memphis. What a blessing. Josiah ended his chemo in June 2010. Since then, his tumor hasn’t grown any, which is amazing. Due to the type and location of his brain tumor — at the top of his brain stem — it can’t be removed, and won’t “melt away” after treatment. However, he could live a long life with it “dormant.” That’s what we continue to pray and hope for, day after day. Since the end of treatment, Josiah has made great progress in catching up with his healthy little friends. He’s feeding himself, walking and starting to talk. He just got his first haircut, after being bald for most of his life. He knows several colors, can follow simple directions and has nicknames for his favorite Pixar movies. He’s in preschool two days a week as of a few months ago, and is always excited to show me what he made when I come home from work. He still gets a checkup MRI every ninety days, and will for the foreseeable future. If any tumor growth is detected, he’ll have to go back on chemotherapy, as he is still too young for radiation. While we are hopeful about Josiah’s future, there is deep worry and stress every time he goes in for a checkup or does something unusual. We have to keep a diligent eye on him, as any change could mean something drastic has happened in his head. Frankly, it’s beyond tiring most weeks. Merri and I are exhausted. As I’ve shared a little bit about here and on Twitter, I was recently diagnosed as suffering from depression. 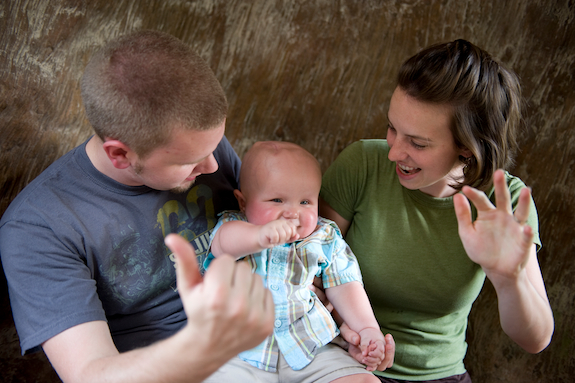 For months, I operated under the idea that I could deal with my own health after Josiah was taken care of. Sadly, it took me a long time to understand that to be the husband and father I needed to be, I had to deal with the clouds in my mind and the weights on my heart. While I’m still no where near where I need to be, I am starting to see a glimpse light at the end of the tunnel. Josiah has been a huge help in this. Every time he yells “Dada” and runs down the hall to find me, my spirits lift. When I see him walking with just a minor limp, or using his left hand, I swell with pride thinking of how hard our toddler has worked in physical and occupational therapy. He’s my hero, in so many ways. He’s done so much better than doctors have said he would do, it’s nothing short of miraculous. So, here’s to many more anniversaries, little man. You’ve been through more than most adults every will, and have done without losing your sweet, gentle demeanor. 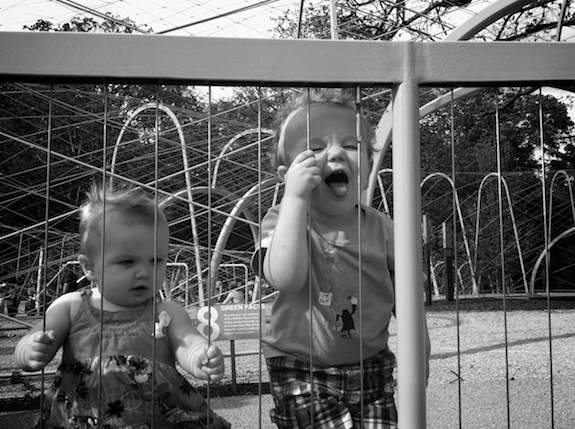 Your little sister has the best big brother a girl could ever have.